Another Grainline Scout pattern hack! I’m getting so much mileage out of this pattern. 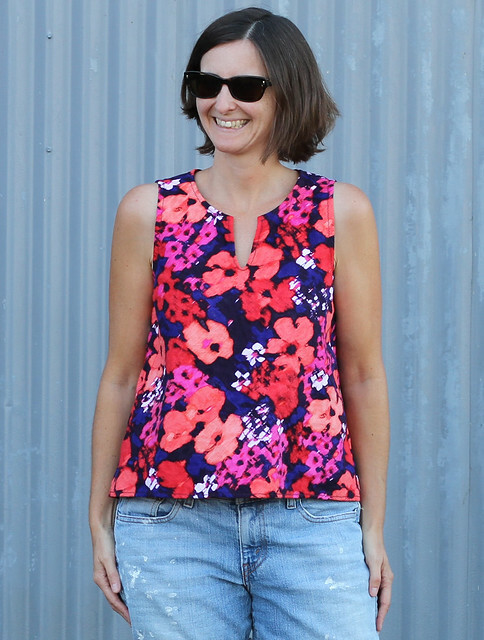 The inspiration for this top started with the Madewell Scout tutorial that Jen posted. I decided to mix it up a little and use it to create my own version of a different Madewell top. There are an awful lot of Madewell tops on my pinterest boards to choose from! I slashed & spread the pattern to create the swing shape and cut in around the shoulders a bit more than on my previous Scout tank hack. I used Madewell Scout variation tutorial for the split neck. I also brought the length up a little. I picked up the fabric from the sale floor at Stonemountain & Daughter. It’s a cotton jacquard with an interesting loose weave. The print is both loud and a floral – not my usual style. This was intended as a wearable muslin but I’ve ended up wearing it quite a bit. I’ve also made another version in a black yarn-dyed linen which I’ll tell you about when I get a picture.